Motto: “Buildings account for one-sixth of the world’s fresh water withdrawals, one-quarter of its wood harvest, and two-fifths of its material and energy flows” (Roodman and Lenssen, 1995). On March 19, at the Crowne Plaza Hotel in Bucharest, the Romania Green Building Council organized a full day course on “Sustainable Construction Materials” to assist manufacturers, designers, and other solution providers in understanding the options available, necessary steps and opportunities related to green construction principles. With more than 60 participants, the event was a great success. Key representatives from the construction sector attended the event, including: constructors, architects and engineers, real estate developers, manufacturers and providers of construction materials, public authorities, academia, etc. The main objective of the course was to highlight the challenges and opportunities on the building materials market, in the context of the rapid changes in the European legislation towards a more ecological and sustainable framework. Speakers included: Florin Dobrescu – Technical Consultant for the Romania Green Building Council, Anamaria Stroia and Iulia Degeratu – Public Managers for the Ministry of Environment, Steven Borncamp – President of the Romania Green Building Council, Anna-Maria Schiau and Alina Cristea – Holcim Romania. The course discussed the implications of the European Directive regarding the Energy Performance of Buildings (EPBD), of the development of criteria for obtaining the European Eco Label in the construction sector (M350), of the Action Plan for Sustainable Consumption and Production/Sustainable Industrial Production (SCP/SIP), of the Directives regarding the Green Public Procurement (GPP), Ecodesign, etc. Another important Directive is the one regulating the Construction Waste, which launches a new challenge for the entire construction industry: By 2020, a minimum of 70% of construction and demolition waste will need to be re-used, recycled or otherwise recovered. Other topics included: sustainable development, green building, regenerative design, or “cradle to cradle”, as well as the transformations that these concepts bring to the building materials industry and to the way in which buildings are designed, constructed, operated, renovated and finally deconstructed. Florin Dobrescu also illustrated the green buildings voluntary certification schemes: LEED (US), BREEAM (UK), HQE (France), Green Star (Australia) and CASBEE (Japan) – through representative projects. Moreover, Mr. Dobrescu highlighted their role in educating the public, in auditing the sustainability and quality of the constructions and in developing industry standards and legislation. The workshop also described the characteristics of the sustainable construction materials in the context of sustainable usage (in terms of durability, ecology, flexibility, reuse, recovery, recycling, etc.). The discussions continued with the presentation of the ways in which a toxic product can be transformed into new, viable products, that meet global and EU environmental standards and qualify for inclusion in green certified buildings. widely used materials: ecological cements, with a carbon footprint reduced by 40%, reinforced concrete with natural or artificial fibers, lightweight aggregate concrete, etc. The attendance of public authority representatives, as well as the discussions among participants illustrated the involvement and the preoccupations of the industry in sustainability and ecology. The event ended with a networking cocktail meant to facilitate the interaction and the collaboration among the workshop participants and the RoGBC members. More photos will be soon published on the event website. The Market Report issued by BNP Paribas Real Estate Romania for year end 2008 offers realistic, accurate and updated information, analyzing the office, residential, retail, industrial, land and investment segments. The Romania Green Building Council also provided support in developing the Sustainability Section of the report. The office market is experiencing the negative effects of the economic downturn manifested in declining rents and leasing activity. Although this segment performed remarkably well during the first semester of 2008, market fundamentals have been softening at a moderate pace especially since the last quarter of the year. As the cost building policies are affecting the demand characteristics, on the long term the proposed supply should adapt to an emerging new trend, the development of green buildings. In 2008 the increasing trend of supply initiated in last two years continued on the residential segment. In the second half of the year, the first challenges appeared for developers, due to the worsening of the local and international economic situation. As a result, many projects experienced slow construction works, while others have been postponed for 2009 or even later. The retail market has experienced a remarkable evolution in 2008, characterized by significant increasing of supply and diversification of retail type of properties. The industrial segment continued to perform remarkably well during H1 2008 as the leasing activity corroborated with the development process contributed to a further market expansion. However, starting with H2 2008 the worsening of the international and local economic context led to the slight decrease of demand, while the launching of new projects was virtually non-existent. During 2008 the land segment has recorded a fundamental change, from a vendor to customer market, this trend becoming more visible in the second half of the year. Despite the evident downtrend in prices, the number of transactions has severely decreased while significant transactions have been virtually non-existent. 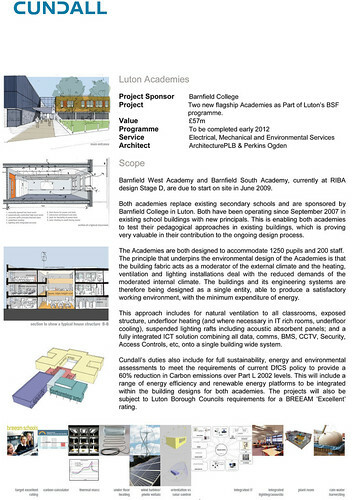 David Clark – the author of the first two documents, has been voted Sustainability Champion of the Year at the UK Sustainable Building Services Awards 2008. This category will be used to present the RoGBC members’ news relevant to the other members and to the entire construction industry. Contact the RoGBC to include your (green building) updates in this section. Please see the attached supplement from the 4 March Times of London. Note – The RoGBC has a page at the end announcing the Council and the support of its founding members. Members of the RoGBC team participated in a “Sustainability in Architecture” conference organized by the Dutch Embassy and SenterNovem. The full day event was attended by 150 people and featured presentations by Ambassador Jaap Werner, Secretary of State Razvan Murgeanu of the Ministry of Regional Development and Housing, H.E. Laszlo Borbely of the Chamber of Deputities, prominent architects, energy efficiency experts and academics. See agenda. Steve Borncamp presented the contributions of the RoGBC member companies during his presentation entitled “Breaking the Circle of Blame in Romania” and moderated a panel discussion on “Competitiveness through Sustainability”. March 11, 2009 at 8:37 pm | Posted in Green Building Projects, Legislative Outreach | Enter your password to view comments. March 11, 2009 at 8:31 pm | Posted in Green Building Projects, Legislative Outreach | Enter your password to view comments.